In 1983, we began with one fully automated barrel zinc machine and grew to two fully automated barrel zinc machines in 1988. 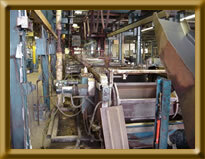 In 1995, a fully automated rack zinc machine was installed, providing customers with full service zinc electroplating capabilities. Today, our computer controlled production equipment provides a potential capacity of more than 250,000 pounds per day of zinc electroplated products! Customers are currently provided service 24 hours a day! For the best zinc plating values in quality, service and cost please Contact Us!